Present state: The platform has been demolished and the area redeveloped for housing. The roadside building was at a higher level this is still extant and in use as a tyre fitting workshop. The substantial goods shed has been restored and is now used as an office in an industrial estate. Notes: Brackley Central was one of the larger intermediate stations on the Great Central, it still had an island platform but the platform buildings were more substantial with a canopy. 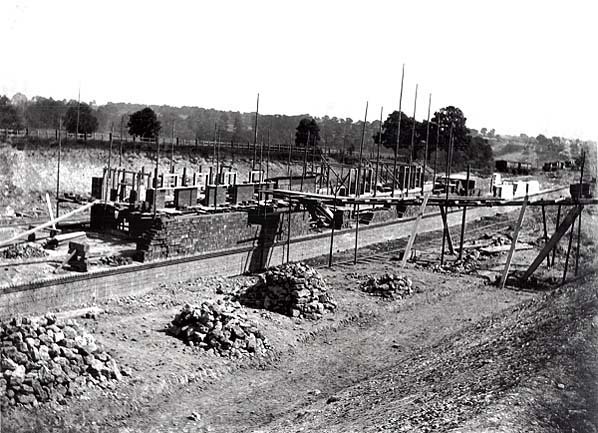 The original plan was to have an entrance on the A43 road bridge, in line with other Great Central stations but following local concerns about traffic congestion a brick booking hall and offices were provided in a lay by off the A43 with a substantial covered footbridge spanning the down line to give access to the platform. Brackley was the only Great Central station built to this design. The goods yard was also on the down side of the line comprising five sidings, one serving a large goods shed which is passed through and another serving cattle pens. The goods yard also handled coal, wool, corn and timber, serving some of the industries of the town and surrounding area. 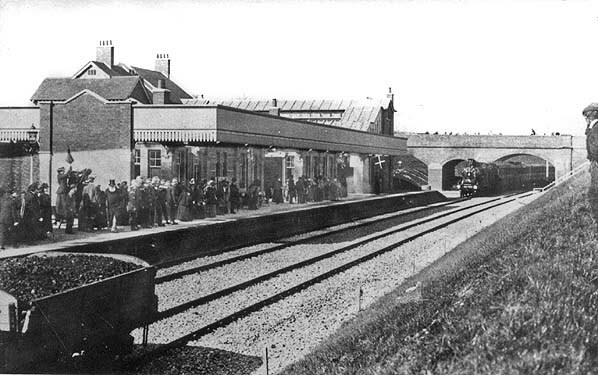 Brackley was quite busy, especially during term time when pupils from outlying villages used the railway to commute to a number of large schools in the town including the Magdalen College School. 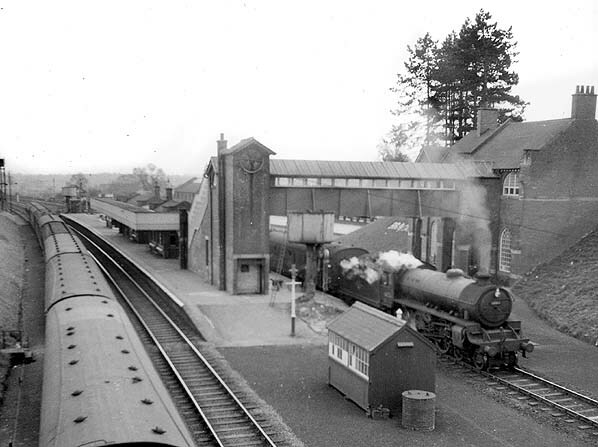 The station survived until final closure of the line in 1966 and was missed by the town after closure with commuters having to travel to Banbury or Bletchley to catch a train. 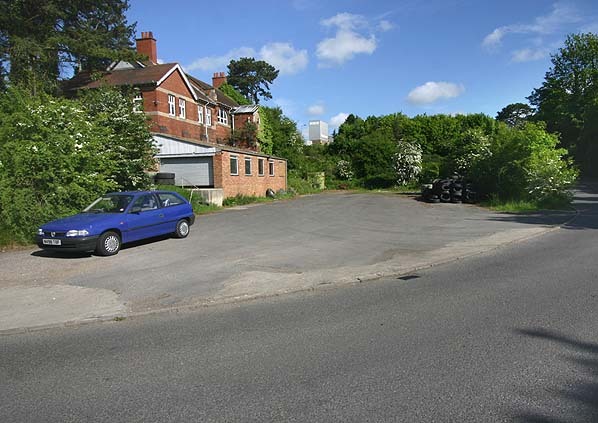 The stationmaster's house was demolished in April/May 2014 to make way for a new roundabout. to London express services were withdrawn on 2nd January 1960 leaving only three semi-fast trains a day and it came as little surprise when the line became the first main line to close in the Beeching era. Beeching considered that the Great Central was a duplicate route which could be sacrificed in favour of the Midland main line. Many of the intermediate stations, including the Chesterfield loop closed on 4th March 1963 and long distance freight services were withdrawn shortly afterwards. Annesley Motive Power Depot (between Nottingham and Sheffield) closed on 3rd January 1966 and Nottingham Victoria closed on 5th September 1966 along with the remaining stations south of Rugby. The track was lifted between Rugby and Calvert leaving a diesel multiple unit (DMU) shuttle service operating between Rugby and Arkwright Street and the southern section of the line between Aylesbury and London Marylebone which still carried considerable commuter traffic. The northern section of the line between Sheffield Victoria and Woodhouse also remained open as this also formed part of the Sheffield to Lincoln line. The line north of Nottingham remained in use until May 1968 serving the collieries at Annesley and Newstead and was eventually lifted in October/November 1969.
join up with the Nottingham tram network and on to Nottingham city centre. Too see other stations on the Great Central Railway between Sheffield Victoria and Aylesbury click on the station name: Aylesbury, Waddesdon, Quainton Road (1st site), Quainton Road (2nd site)**, Calvert, Finmere, Helmdon, Culworth, Woodford Halse, Charwelton, Braunston & Willoughby, Rugby Central, Lutterworth, Ashby Magna, Whetstone, Leicester Central, Leicester North***, Belgrave & Birstall, Rothley**, Swithland****, Quorn & Woodhouse**, Loughborough Central**, East Leake, Rushcliffe Halt**, Ruddington, Ruddington Factory Halt, Arkwright Street, Nottingham Victoria, Carrington, New Basford, Bulwell Common, Bulwell Hall Halt, Hucknall Central, Annesley South Junction Halt, Hollinwell & Annesley, Kirkby Bentinck, Tibshelf Town, Pilsley, Heath, Staveley Central, Renishaw Central, Killamarsh Central, Beighton (1st site), Beighton (2nd site), Woodhouse Junction, Woodhouse*, Darnall*, Sheffield Victoria & Sheffield Bridgehouses. 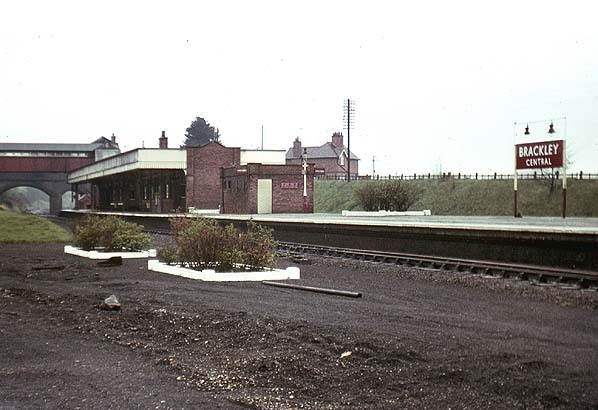 Brackley Central Station in c.1966, the stationmaster's house can be seen to the rear. 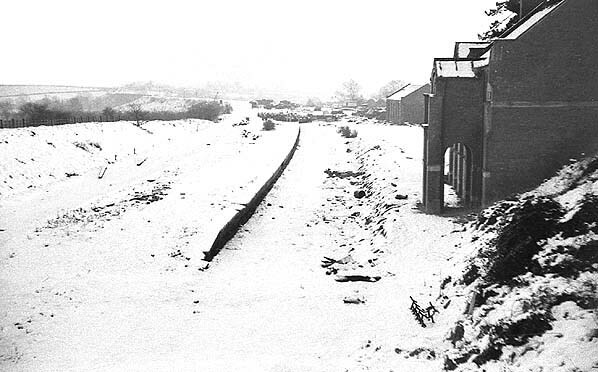 Brackley Station looking south in December 1968. The line only closed two years early and the buildings were quickly demolished. The site of Brackley Central Station looking north in May 2008. The truncated bridge from the rear of the station building can be seen.